Synopsis: Meet counter-espionage organization Control and its top agent Maxwell Smart –who has been specially trained never to disclose the fact that he’s a spy –except maybe when his shoe phone rings in symphony hall. Agent 86 must: find Agent 99, rescue Professor Dante and get his mitts on Dante’s Inthermo before Mr. Big uses it to blow up the Statue of Liberty. Max and 99 try to steal a kiss after nearly being vaporized by the inthermo. My Thoughts: I guess if I have to blame something for my Get Smart addiction, it would be the black and white pilot. I never get tired of this episode. Over on www.ilovegetsmart.com I have it listed as my number four favorite episode. In comparison to how the series progressed, Max, 99 and the Chief are a bit “raw,” yet this really is a tight little episode. 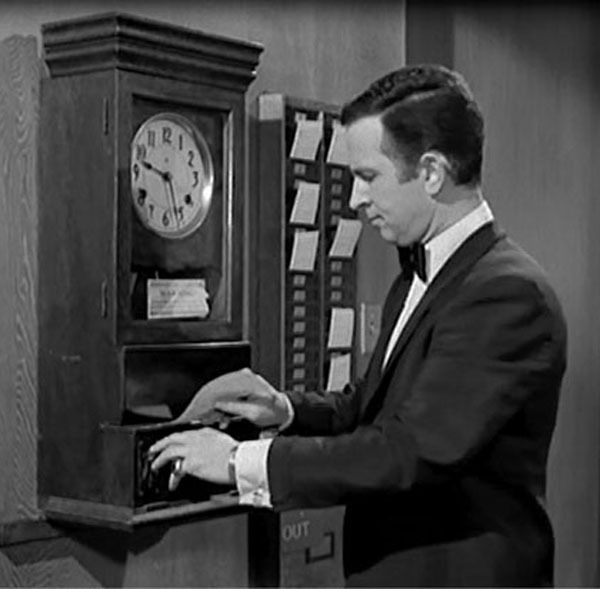 I first saw this episode in January of 1991 when Nick at Nite began airing Get Smart. Unlike the rest of my Chicagoland pals who watched the show in reruns during the ’80s on Channel 32, I had never seen it before. 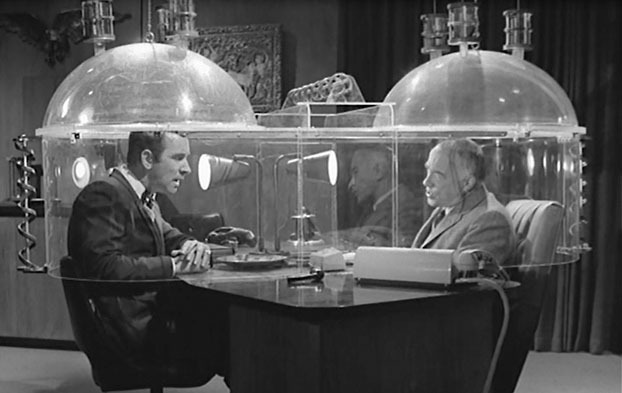 I lived in the Mid-Atlantic prior to the ’90s and there was no Get Smart to be found on Baltimore TV. Being an ’80s kid, there was one thing that made me raise an eyebrow the first time I saw the pilot — the voice. I wondered, why does this guy sound like Inspector Gadget? He’s even got an inflatable coat, a dog and a brainy female sidekick like Inspector Gadget did! My 12 year old mind was impressed. The scene in this episode I love the most is Max and 99’s near kiss. After Fang saves Max from being vaporized, 99 takes off her hat and shakes out her hair. This prompts Max to utter, “Why you’re a girl!” The two then go for a kiss, which Fang interrupts. Logically the whole concept of this scene is absurd -especially for the fact that Mr. Smart clearly needed a stronger pair of Bino-Specs with regard to 99. 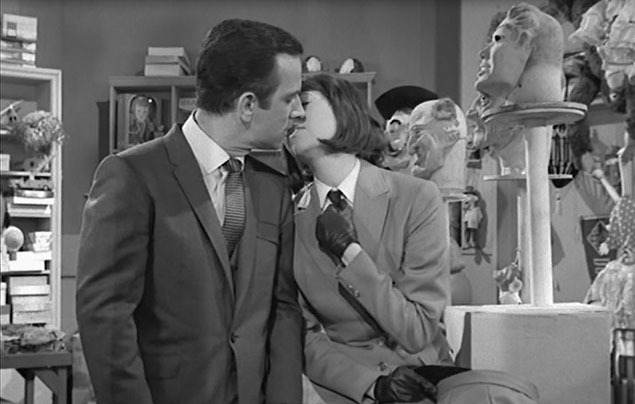 Comically it takes the opportunity to mock spy movie heroes that make out with Bond girls they’ve just met. Max clocks in before his assignment. • This is the only black and white episode of the series. • The opening is slightly different. Max drives a Ferrari 250 GT Cabriolet and tosses a hat into the back seat. This is the only time this car is used. In the rest of the episode 99 attempts to drive a limo and Max attempts to close the vehicle’s door. 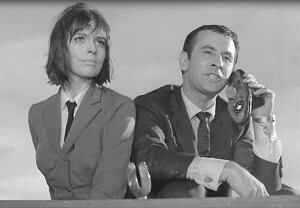 • During filming of the pilot Don Adams learned that his wife Dorothy gave birth to their daughter Stacey Noel. • Michael Dunn had quite a bit of experience playing the archenemy of secret agents – he had a reoccurring role as evil Miguelito Loveless on The Wild Wild West. • “Zelinka” is an in-joke – Executive Producer Leonard Stern’s co-writer on The Honeymooners was Sydney Zelinka. • Howard Morris worked with Mel Brooks on Your Show of Shows and he played Ernest T. Bass on the Andy Griffith Show. • Dante’s Inthermo is a reference to Dante’s Inferno. • Vito Scotti was probably in every old TV show known to man. • Karen Norris had a role in the movie Fitzwilly which starred Barbara Feldon. Oh Max meter: Probably the only episode 99 refers to Agent 86 as Maxwell. They haven’t quite hit their stride. Agents 86 and 99 report that they've wrapped up their mission - only to get a wrong number. This entry was posted in Episodes, Season One and tagged Buck Henry, Howard Morris, Jay Sandrich, Mel Brooks, Michael Dunn, Vito Scotti by admin. Bookmark the permalink. If only he knew what that Ferrari would be worth one day. It is now the worlds most valuable car, recently an example sold for around 30 million usd!! I would like to know who was the kid. He looks SO familiar but I can’t find any record of him.